Object-oriented programming (OOP) represents an attempt to make programs more closely model the way people think about and deal with the world. In the older styles of programming, a programmer who is faced with some problem must identify a computing task that needs to be performed in order to solve the problem. Programming then consists of finding a sequence of instructions that will accomplish that task. But at the heart of object-oriented programming, instead of tasks we find objects -- entities that have behaviors, that hold information, and that can interact with one another. Programming consists of designing a set of objects that somehow model the problem at hand. Software objects in the program can represent real or abstract entities in the problem domain. This is supposed to make the design of the program more natural and hence easier to get right and easier to understand. To some extent, OOP is just a change in point of view. We can think of an object in standard programming terms as nothing more than a set of variables together with some subroutines for manipulating those variables. In fact, it is possible to use object-oriented techniques in any programming language. However, there is a big difference between a language that makes OOP possible and one that actively supports it. An object-oriented programming language such as Java includes a number of features that make it very different from a standard language. In order to make effective use of those features, you have to "orient" your thinking correctly. As I have mentioned before, in the context of object-oriented programming, subroutines are often referred to as methods. Now that we are starting to use objects, I will be using the term "method" more often than "subroutine." Objects are closely related to classes. We have already been working with classes for several chapters, and we have seen that a class can contain variables and methods (that is, subroutines). If an object is also a collection of variables and methods, how do they differ from classes? And why does it require a different type of thinking to understand and use them effectively? In the one section where we worked with objects rather than classes, Section 3.9, it didn't seem to make much difference: We just left the word "static" out of the subroutine definitions! I have said that classes "describe" objects, or more exactly that the non-static portions of classes describe objects. But it's probably not very clear what this means. The more usual terminology is to say that objects belong to classes, but this might not be much clearer. (There is a real shortage of English words to properly distinguish all the concepts involved. An object certainly doesn't "belong" to a class in the same way that a member variable "belongs" to a class.) From the point of view of programming, it is more exact to say that classes are used to create objects. A class is a kind of factory -- or blueprint -- for constructing objects. The non-static parts of the class specify, or describe, what variables and methods the objects will contain. This is part of the explanation of how objects differ from classes: Objects are created and destroyed as the program runs, and there can be many objects with the same structure, if they are created using the same class. Note that the static variable playerCount is part of the class, and there is only one copy. On the other hand, every object contains a name and an age. 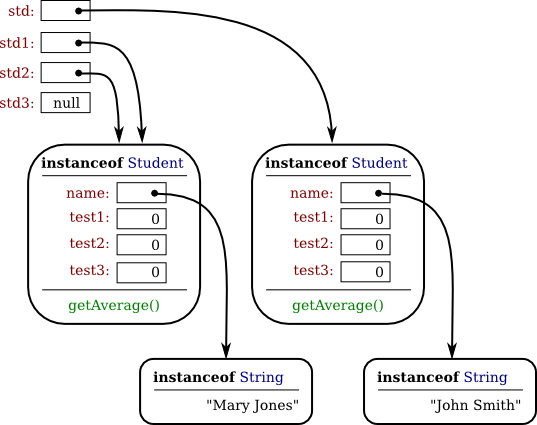 An object that is created from a class is called an instance of that class, and as the picture shows every object "knows" which class was used to create it. I've shown class PlayerData as containing something called a "constructor;" the constructor is a subroutine that creates objects. Now there can be many "players" because we can make new objects to represent new players on demand. A program might use the PlayerData class to store information about multiple players in a game. Each player has a name and an age. When a player joins the game, a new PlayerData object can be created to represent that player. If a player leaves the game, the PlayerData object that represents that player can be destroyed. A system of objects in the program is being used to dynamically model what is happening in the game. You can't do this with static variables! "Dynamic" is the opposite of "static." An object that is created using a class is said to be an instance of that class. We will sometimes say that the object belongs to the class. The variables that the object contains are called instance variables. The methods (that is, subroutines) that the object contains are called instance methods. 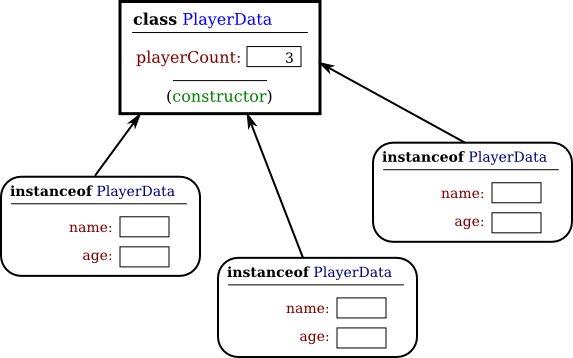 For example, if the PlayerData class, as defined above, is used to create an object, then that object is an instance of the PlayerData class, and name and age are instance variables in the object. My examples here don't include any methods, but methods work similarly to variables. Static methods are part of the class; non-static, or instance, methods become part of objects created from the class. It's not literally true that each object contains its own copy of the actual compiled code for an instance method. But logically an instance method is part of the object, and I will continue to say that the object "contains" the instance method. Note that you should distinguish between the source code for the class, and the class itself (in memory). The source code determines both the class and the objects that are created from that class. The "static" definitions in the source code specify the things that are part of the class itself (in the computer's memory), whereas the non-static definitions in the source code specify things that will become part of every instance object that is created from the class. By the way, static member variables and static member subroutines in a class are sometimes called class variables and class methods, since they belong to the class itself, rather than to instances of that class. As you can see, the static and the non-static portions of a class are very different things and serve very different purposes. Many classes contain only static members, or only non-static, and we will see only a few examples of classes that contain a mixture of the two. public String name;  // Student's name. public double test1, test2, test3;   // Grades on three tests. In Java, no variable can ever hold an object. A variable can only hold a reference to an object. You should think of objects as floating around independently in the computer's memory. In fact, there is a special portion of memory called the heap where objects live. Instead of holding an object itself, a variable holds the information necessary to find the object in memory. This information is called a reference or pointer to the object. In effect, a reference to an object is the address of the memory location where the object is stored. When you use a variable of object type, the computer uses the reference in the variable to find the actual object. would create a new object which is an instance of the class Student, and it would store a reference to that object in the variable std. The value of the variable is a reference, or pointer, to the object. The object itself is somewhere in the heap. It is not quite true, then, to say that the object is the "value of the variable std" (though sometimes it is hard to avoid using this terminology). It is certainly not at all true to say that the object is "stored in the variable std." The proper terminology is that "the variable std refers to or points to the object," and I will try to stick to that terminology as much as possible. If I ever say something like "std is an object," you should read it as meaning "std is a variable that refers to an object." More generally, you could use std.name any place where a variable of type String is legal. You can use it in expressions. You can assign a value to it. You can even use it to call subroutines from the String class. For example, std.name.length() is the number of characters in the student's name. if (std == null) . . . If the value of a variable is null, then it is, of course, illegal to refer to instance variables or instance methods through that variable -- since there is no object, and hence no instance variables to refer to! For example, if the value of the variable std is null, then it would be illegal to refer to std.test1. If your program attempts to use a null pointer illegally in this way, the result is an error called a null pointer exception. When this happens while the program is running, an exception of type NullPointerException is thrown. std2, std3;    //   type Student. //   object in the variable std. //   it in the variable std1. //   into the variable std2. std.name = "John Smith";  // Set values of some instance variables. to another, only a reference is copied. The object referred to is not copied. When the assignment "std2 = std1;" was executed, no new object was created. Instead, std2 was set to refer to the very same object that std1 refers to. This is to be expected, since the assignment statement just copies the value that is stored in std1 into std2, and that value is a pointer, not an object. But this has some consequences that might be surprising. For example, std1.name and std2.name are two different names for the same variable, namely the instance variable in the object that both std1 and std2 refer to. After the string "Mary Jones" is assigned to the variable std1.name, it is also true that the value of std2.name is "Mary Jones". There is a potential for a lot of confusion here, but you can help protect yourself from it if you keep telling yourself, "The object is not in the variable. The variable just holds a pointer to the object." You can test objects for equality and inequality using the operators == and !=, but here again, the semantics are different from what you are used to. When you make a test "if (std1 == std2)", you are testing whether the values stored in std1 and std2 are the same. But the values that you are comparing are references to objects; they are not objects. So, you are testing whether std1 and std2 refer to the same object, that is, whether they point to the same location in memory. This is fine, if it's what you want to do. But sometimes, what you want to check is whether the instance variables in the objects have the same values. To do that, you would need to ask whether "std1.test1 == std2.test1 && std1.test2 == std2.test2 && std1.test3 == std2.test3 && std1.name.equals(std2.name)". The fact that variables hold references to objects, not objects themselves, has a couple of other consequences that you should be aware of. They follow logically, if you just keep in mind the basic fact that the object is not stored in the variable. The object is somewhere else; the variable points to it. // The value stored in stu is not changed! // It still refers to the same object. output the value 17.                    output the value "Fred". changed by the subroutine,              changed, but stu.name is changed. When writing new classes, it's a good idea to pay attention to the issue of access control. Recall that making a member of a class public makes it accessible from anywhere, including from other classes. On the other hand, a private member can only be used in the class where it is defined. titleAccessCount++;  // Increment member variable titleAccessCount. if ( newTitle == null )   // Don't allow null strings as titles! title = "(Untitled)";  // Use an appropriate default value instead. Even if you can't think of any extra chores to do in a getter or setter method, you might change your mind in the future when you redesign and improve your class. If you've used a getter and setter from the beginning, you can make the modification to your class without affecting any of the classes that use your class. The private member variable is not part of the public interface of your class; only the public getter and setter methods are, and you are free to change their implementations without changing the public interface of your class. If you haven't used get and set from the beginning, you'll have to contact everyone who uses your class and tell them, "Sorry people, you'll have to track down every use that you've made of this variable and change your code to use my new get and set methods instead." A couple of final notes: Some advanced aspects of Java rely on the naming convention for getter and setter methods, so it's a good idea to follow the convention rigorously. And though I've been talking about using getter and setter methods for a variable, you can define get and set methods even if there is no variable. A getter and/or setter method defines a property of the class, that might or might not correspond to a variable. For example, if a class includes a public void instance method with signature setValue(double), then the class has a "property" named value of type double, and it has this property whether or not the class has a member variable named value. As I noted in Subsection 3.8.1, arrays are objects. Like Strings they are special objects, with their own unique syntax. An array type such as int or String is actually a class, and arrays are created using a special version of the new operator. As in the case for other object variables, an array variable can never hold an actual array -- only a reference to an array object. The array object itself exists in the heap. It is possible for an array variable to hold the value null, which means there is no actual array. newlist = list; // newlist points to the same array as list! would be 42, not 17, since list and newlist are just different names for the same element in the array. All this is very natural, once you understand that arrays are objects and array variables hold pointers to arrays. This fact also comes into play when an array is passed as a parameter to a subroutine. The value that is copied into the subroutine is a pointer to the array. The array is not copied. Since the subroutine has a reference to the original array, any changes that it makes to elements of the array are being made to the original and will persist after the subroutine returns. Student classlist;  // Declare a variable of type Student. classlist = new Student;  // The variable now points to an array. Once we have done this, each classlist[i] points to an object of type Student. If we want to talk about the name of student number 3, we can use classlist.name. The average for student number i can be computed by calling classlist[i].getAverage(). You can do anything with classlist[i] that you could do with any other variable of type Student.